Great Britain eventer William Fox-Pitt won his third Kentucky title in five years after a nerveless showjumping performance on Bay My Hero. The Olympian, 45, jumped clear to finish on 44 penalties overall with American Lauren Kieffer, aboard Veronica, second with a score of 46.7. 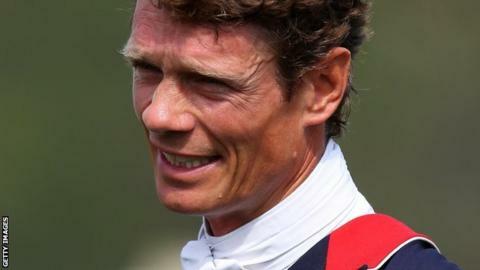 Fox-Pitt said: "He's not that experienced at this level, but gave me a confident ride. He felt fantastic." American Buck Davidson and his mount Ballynoe Castle finished third. Fox-Pitt's victory also installed him as clear leader in the FEI Classics Series after three of the six counting events as he warmed up for next month's Badminton Horse Trials in impressive fashion. The Dorset-based rider, who also who won at Kentucky in 2010 with Cool Mountain and two years ago aboard Parkland Hawk, finished ninth on his second ride Seacookie, while fellow British challenger Sarah Bullimore was 13th on Reve du Rouet. But it proved a day to forget for world number one Andrew Nicholson and his reigning Burghley champion Avebury as they dropped from seventh place to 21st after having six showjumping fences down.